Cook up some fun in a toy kitchen. 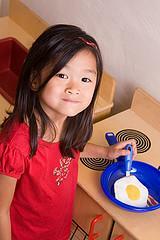 Toy kitchen centers can provide hours of entertainment for boys and girls. Although some parents may balk at the idea of a boy playing in a kitchen and consider it more of a popular girls toy, don't forget that many of the world's top chefs are men. Kitchen centers come in two varieties: plastic and wooden. In general, plastic sets are less expensive than wood ones. Wooden sets are heavier and sturdier, but can be rather pricey, so if price is a concern, keep that in mind. Easy clean-up: With plastic or wooden kitchen sets, clean up involves little more than wiping with a damp rag, making it easy to keep them clean. Lightweight: Plastic sets are lighter than wooden sets. A young child is capable of pushing around a plastic set, but may not be able to move a wood set. Placement: Because wooden sets are heavy, once they're placed in a room or playroom, they tend to stay in one spot. Plastic sets can be moved from room to room, which is important if a parent has work to do in a home office or chores in another part of the home; simply set up the toy kitchen nearby and your child can keep herself occupied while you tend to other things. Plastic sets also work on patios or decks. If they get wet with dew or rain, it's harmless to the material. You may find complete sets or you might have to buy some pieces separately. Food: Like toy kitchen centers, you can find play food in plastic or wooden varieties. Play food is usually sold next to the kitchens so you can buy all of your accessories at once. There's no rule that says you can't mix plastic with wood, either. Aprons and hats: Sew your own or buy child-sized aprons and chef hats for the kids to wear while they're playing. Pots and pans: Buy toy pots and pans or let your child use what's already in your kitchen. Kids usually delight in playing with plastic or wooden spoons and small pots from their parents' kitchen. Give them old potholders and dish towels as well. You can also set up a toy kitchen in or alongside your real kitchen. As you prepare meals, your child may pretend to do the same, allowing you to complete a task while he remains occupied. Step2 has a selection of toy kitchens in a range of prices. Choose simple play kitchens or go for more elaborate sets which closely mimic the kitchen in your home. Find food, cutlery and dishes to match. 1888 Toys carries a large variety of toy kitchen pieces, from complete kitchen sets to food and shopping baskets. Toys R Us, the longtime staple, has kitchen centers in a range of prices, from an affordable under $100 to over $300. If you want a toy kitchen at a cheaper price, look for garage sales and eBay listings. These toys usually hold up well to typical wear and tear, so a set that's been loved and used for years can still be in good condition. Giving a child a toy kitchen set is a good way to foster independent, gender-free play. It's an activity boys and girls can enjoy together, whether they're making pretend tea with an accompanying tea set or food to feed to their dolls and stuffed animals. Who knows--you might be sowing the seeds of a future chef!